Your academic advisor will contact you to discuss your plans and help you to devise a class schedule. Each advising unit has its own unique way of connecting with new transfer students, so wait to hear from your advisor (either by phone, email or regular mail). Academic advising at the University at Buffalo is delivered through a network of professional advising centers. Students are assigned to an academic advising unit/advisor based upon their declared or approved major and special population affiliation if applicable. Students who have not selected a major will be advised by the staff in the Exploratory and Pre-Professional Advising Center﻿. You can also locate your academic advisor by using the Advising Directory. How Can I Best Prepare for Working with My Advisor? Submit your immunization records to Student Health Services. You will not be able to register for classes until you have fulfilled this requirement. Be sure that you have submitted transcripts for coursework like AP or college credits. Review your Transfer Credit Report: are all your transfer credits listed on the report? Research the majors at UB by learning to use the undergraduate degree & course catalog. If you know your major, review the required courses for the major. Look up course descriptions online. Most importantly respond to any communications from your advisor and complete any supplemental materials/assignments that your advisor may require. Some students will enter UB with Advanced Placement (AP) credit; this credit can count towards a UB degree or in some cases credit towards major and UB Curriculum (general education) requirements. Official transcripts from the College Board must be sent to UB. Please use school code 2925; be sure to use this code to distinguish UB (SUNY Center Buffalo) from SUNY College Buffalo (Buffalo State). To avoid any duplication of coursework tell your advisor about your AP credit as it may affect the courses you registered for in your first semester. Transfer students must have their original score sent to UB from the College Board. UB will not accept scores from a previous institution. It is important that you tell your advisor about any college credit you have earned. Your advisor will need to know the school, course name, and number for all college level credit completed. Students who are transferring SUNY courses to UB and wish to appeal the transfer credit evaluation and course equivalencies awarded by UB may utilize the SUNY Transfer Appeal Process. 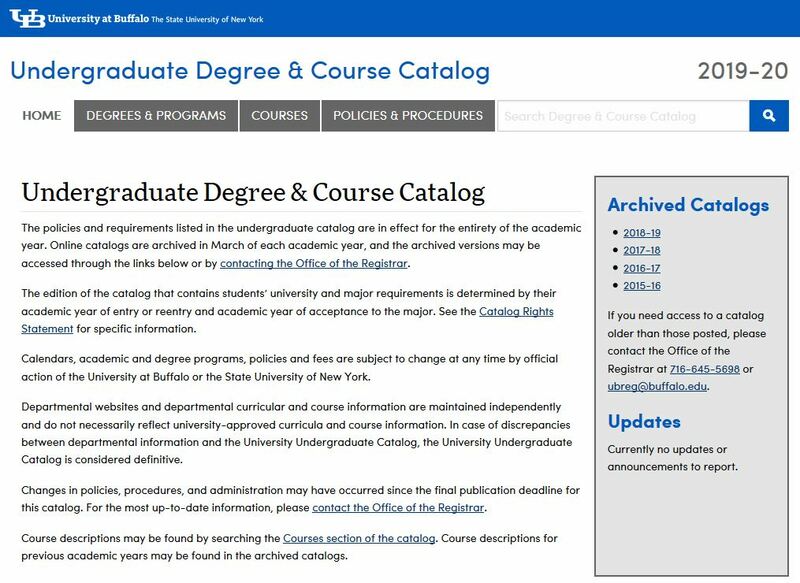 The university online Undergraduate Degree & Course Catalog is a resource that will help you research majors and courses at UB. The catalog contains information about UB’s majors, degree requirements, UB Curriculum (general education) requirements, and academic policies. From the catalog’s homepage you will find a navigation bar that includes Degrees & Programs, Courses and Policies & Procedures. Degrees & Programs: View a complete listing of all the majors available here at UB, along with minors and certificates. Courses: Use this feature to search UB courses. Policies & Procedures: This leads you to information on University Degree Requirements (including the UB Curriculum), Finish in Four information, among many topics. The UB Curriculum is a unique program of general education for all undergraduate students at UB. Serving as the core academic experience, it celebrates the joy of intellectual discovery and prepares students for life, career and citizenship in a diverse and dynamic world. Your academic advisor will recommend courses for your first semester at UB. This recommendation is based on your major and any course work you have transferred to the university. After speaking with your academic advisor you will register yourself for classes using the HUB Student Center via MyUB. MyUB is UB’s online portal for students that contains links to the many UB tools, resources, and services, such as UBmail, the UBlearns course management system, and the HUB Student Center. You will need your UBIT Name & Password to access MyUB. The HUB Student Center is accessed from a tab on MyUB. The HUB Student Center is an online one-stop shop for students; from the center students can register for classes, check their grades, request transcripts, manage their finances/financial aid, maintain their personal information, and much more. To graduate on time and qualify for financial aid and some scholarships, students need to complete at least 15 credits a semester (or 30 credits a year). If you have any questions about registration contact your academic advisor. Review your class schedule in the HUB Student Center, if you have any questions about your schedule contact your academic advisor. Review the Understanding Your Class Schedule Tutorial. The tutorial contains a sample schedule with explanations to help you understand how it works. As a registered student at UB, you are financially and academically responsible for the courses in which you are enrolled. If you find that you will not be able to attend UB this semester, please contact your academic advisor to ensure that your courses are dropped. You should also make sure you cancel your enrollment in any other campus services (housing, dining services, etc.) Please consult the When You’re Not Enrolling at UB Checklist for guidance. What if I am not sure yet what I want to major in? General/liberal studies is not a choice of a major at UB. A general guideline for making “academic progress” is that students with 60 or more credits have an accepted major. Majors vary in the number of credit hours they require and length of time they take to complete regardless of your class year or already completed credits. Upon choosing a major, especially if you are changing, you should complete a detailed academic plan with your advisor. What is the difference between declared (intended) and an accepted major? A declared or intended major is a major that you would like to pursue; an accepted major is the status of a student who has been formally admitted into a major. Most majors at UB have specific acceptance criteria that must be completed before entrance into the major. These requirements can include: certain courses, minimum grades, applications, deadlines, portfolio reviews or auditions, etc. Degree requirements and acceptance criteria for all UB majors can be found in the Degrees & Programs section of the Undergraduate Degree & Course Catalog. What if I have changed my mind about the major I indicated on my application? If you decide that you are interested in pursuing a different major, please contact Orientation, Transition & Parent Programs (UNLESS you have already registered for classes, then contact your advisor). Remember, the courses that we have recommended are based on your intended major. We will work with you to make any necessary changes to your schedule should your declared (intended) major change. What is an Advisement Report? The Academic Advisement Report (AAR) is an advising tool that tracks your progress towards graduation by showing how courses taken meet graduation requirements at UB. You can generate an AAR from your HUB Student Center via MyUB. For instructions on how to generate and understand an AAR see the My Advisement Report Overview (PDF). What is a Transfer Credit Report? The Transfer Credit Report (TCR) is an advisement tool that lists incoming transfer courses including credits and grades. The report also provides the UB course equivalencies for incoming credit. The Transfer Credit Report is used in conjunction with the Advisement Report to track progress towards completing university degree requirements. For instructions on how to generate and understand a TCR see the My Transfer Credit Evaluation Overview (PDF). Students register for classes using the HUB Student Center via MyUB. Step by step directions on how to register for classes are available on the HUB Support website, see the Enroll by Class Search (PDF) tutorial. Prior to registering for classes students should consult with their academic advisor to discuss appropriate courses. How can I tell if UB has received all of the transfer credit from my former school? The Transfer Credit Report provides a listing of all the incoming courses, credits, and grades along with UB course equivalencies. If you have questions about how your transfer credit counts towards UB requirements, contact your academic advisor. What if I took Advanced Placement (AP) courses? You MUST have the College Board/ETS send an official report of your scores to UB. This transcript information is not sent by your previous school. Be sure to tell your advisor if you have AP credit, because this may affect your course selection. See Advanced Placement (AP) or Prior College Credit for more information. What if I change my plans and choose not to attend UB? You must complete the Not Enrolling at UB form (PDF). If you believe you’ll be able to enroll at UB for a future term, please contact the Office of Admissions, they can retain your application for entry at a future time. There is a deadline date for dropping courses without financial penalty in each semester. Refer to the Student Calendars to see the deadline date for the semester you are enrolled.